Logistical barriers can sometimes stand between you and your objectives. Apply for these transportation industry scholarships! The Advancing Women in Transportation Metropolitan Phoenix Chapter is offering six scholarships totaling $17,500 to assist women aspiring to have transportation careers. Submit your application to Barbara Ritter at wtsmetrophoenix@gmail.com by Monday, November 27, 2018. Helen M. Overly/Esther Kmetty Scholarship: open to women pursuing graduate studies in transportation and with a commitment to the community. Sharon D. Banks Memorial Undergraduate Scholarship: Awarded to a woman pursuing an undergraduate degree who are enrolled full-time in transportation studies. Molitoris Leadership Fund for Undergraduates: Awarded to a woman demonstrating leadership in the transportation industry, who is enrolled full-time in an undergraduate degree program. Support Sky Harbor Coalition Scholarship: Awarded to a woman pursuing studies in an aviation-related field, with demonstrated leadership skills and campus/community involvement. AzTA Transit Planning Scholarship: Award to a woman pursuing graduate studies in various majors, including engineering and transportation planning with an emphasis on public transportation /multi-modal components. 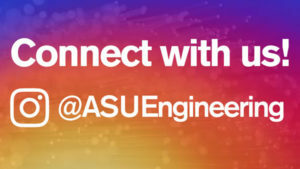 This award includes free participation in all Association events, including interface opportunities with the AzTA Board of Directors for the academic year. Returning Student Scholarship: Awarded to a woman transportation professional returning to school to pursue a degree in transportation. 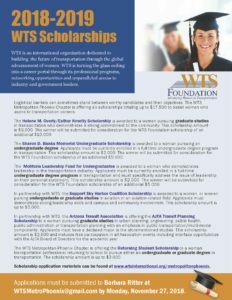 WTS is an international organization dedicated to building the future of transportation through the global advancement of women. It offers professional programs, networking opportunities and access to industry and government leaders.